I having travelling down this road for several years now. A few people understand what I am doing but few don’t get it or understand. I cannot fully explain how this journey ultimately affects my career but I know one thing. It is a lot of work. It takes time away from family, friends and unfortunately my garden and gold game. I didn’t have a good one in the first place. However the process of getting to a competition whether it be the culinary Olympics or your first amateur baking contest is the same. 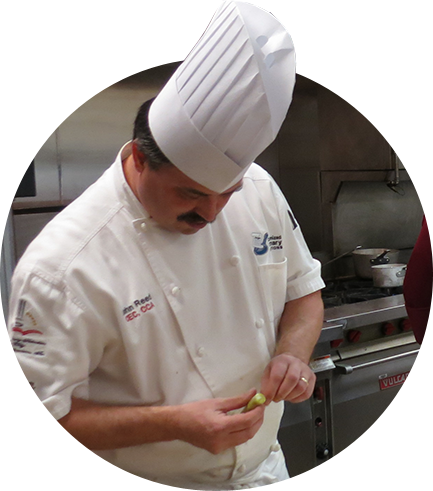 Here are some the ways this process has helped with my career and especially my cooking. You need to be extremely organized and thorough in your preparations, shopping, packing and in the kitchen. I use multiple pack lists to make sure I have everything I need. My process begins with the schedule. I mark my calendar well in advance and set practice dates, shopping days and prep days prior to practice or competition. Running my own business, I am the company. I don’t have the luxury of a purchasing department. I have to shop both retail and from wholesalers. 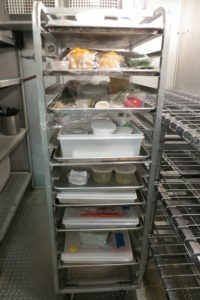 It requires a planned route with the right coolers to hold the items and shopping list to make the process smooth. Shopping for everything yourself helps in other ways which I will explain later. Once you get everything purchased and ready, you need to have a place for it and the right tool or container to process it further. If you pay any attention to the industry news and the prices of items at your local grocery store, you realize that food is not cheap anymore. 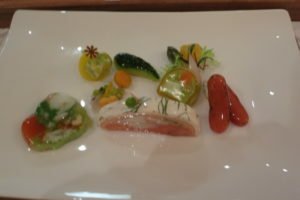 This preparation of food for sometimes non-consumption is expense. I try not to be wasteful. You need to purchase just what you need. When buying asparagus, by one really good bunch not two. Try and figure out how to get the greatest yield out of an item. In the case of asparagus, the money is the tips nut what can you do with the stalks, and peels? It takes thought and discipline not to throw it in the can. With the focus on “whole hog” butchery, this same principle can be applied to anything. This study of every aspect of an ingredient forces to you to continually look at others. Research and development are a huge part of the this process. Looking at menus, reading texts, listening, web-browsing and of course tasting is vital to the success of a finished dish. I spend a vast amount of time visualizing flavors, colors, shapes, textures and compatibility of foods in my head. In the morning having a coffee, during my runs and even at the oddest times. Things pop into your head. I get an idea then I research the concept and see if I can find some reference to an already know dish in a book or restaurant. You look at anything that is going to give you an advantage. “Does it make sense” are words that continually filter through this learning process. You can’t just sometimes do something for the sake of just doing it. It can work but for a competitor at the highest level, it is all about perfection. It comes down to details. 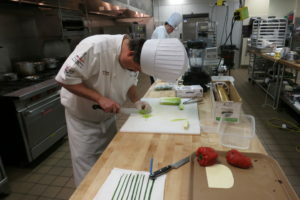 In the world of culinary competition, it is the detail and preciseness of a cold food platter that is the difference between a certificate and a medal. It is the perfection and minute details that make the difference in that exclusive gold medal. Items which are presented cold can be weighed, measured and dissected to ensure that those details are consistent in every item presented. Having spent hours coating items in gel where you are concerned about the affect of air movement and ripples you might get the picture. It can drive you crazy sometimes. It is all about the pursuit of perfection. You have to be motivated to do the work. When preparing and training, there is always something to do. Cold food takes time. Being on your feet for 24 to 36 hours is not uncommon for culinary competitors. In the hot kitchen, there is no time to spare and you can’t believe how time flies and how little time you have in reality. Three and half hours can feel like 30 minutes. You need to be mentally as well as physically fit. If you look at each of the traits that I briefly describe, you will see the characteristics of some of the best chefs I know. That is why I do it. I want to be around them and challenge myself against the best. If you want to know more read this article at the link below.